"Hello: This afternoon I would like to tell you about my family, as my sons pioneered this very lot when this SW corner of Puslinch was first settled. I was born "Grisell" (Grace in English) McKinnon in 1779 in the Killean area of the Kintyre Peninsula in Argyleshire, Scotland. I married Angus Blue there but he died at the age of 34, leaving me with a family of 3 sons and 4 daughters. Then I married Neil McPhatter in Killean, Scotland in 1814. Neil and I had twin sons the next year, but one (John) only lived a year. His brother Matthew was followed by a sister, and 3 brothers. In 1831, Neil and I arrived with our children in Little York (a fledgling Toronto) where we stayed for a year along with other Kintyre families we had travelled with like the Thompsons. We were living on Yonge St. and there met P.L.S. David Gibson who was surveying the Township of Puslinch at that time. He advised the men to take a look at lots in the 1st Concession. Neil, his step-son William Blue, and Big John and Little John Thompson came via Galt and were escorted by assistant-surveyor Peter McBeath to see the lots available. Neil and the Thompson men put up a shanty on Lot 15 to start out before bringing out their families from York the next spring. The McPhatters, Blues and Thompsons were impressed with the land at the intersection of Mill Creek and Concession 1. For this reason, Lots 9 to 21, F. Concession 1 were sold to this group from Kintyre in a land sale at York in 1832. Since they had emigrated from the Killean area, half way up the west coast of Kintyre, they gave the name Killean to this area of Puslinch. Others purchasing these first Lots were Angus McDonald, a Mr. McNeill, Alexr McNaughton, Archd McShannon, and Malcolm Smith who was my son-in-law, married to my daughter Grace Blue. According to the Annals of Puslinch many others closely related to this group followed. McMillans, Ramsays, Gilchrists and McLartys were among the earliest. Land ownership back in Scotland was complicated, with our Killean people tenant farmers. After the Jacobite rebellion of 1745 and the onset of less troubled times, most of the Blue families settled in the Largieside are of Kintyre where they were millers. By 1806, 60 years later, many of the farmers in Kintyre were actively engaged in the making of illicit whisky in order to be able to pay the high rents demanded by landowners of that period. A recent publication in Scotland by Ian MacDonald, called The Largieside Distillers lists the Blue family as part of this report, including several other families from SW Puslinch. [See a copy in the PHS archives.] In 1880, the factor to Lord Stonefield surveyed Ontario and the Prairie Provinces of Canada on behalf of the Kintyre Agricultural Society for further emigration. He found that descendants of shareholders in the still that was a major supplier for Kintyre were "well-doing farmers owning their own lands, many named after the places their ancestors had left." Once in Puslinch, the opportunity to be landowners (Yeomen) rather than tenants meant everything to the former Kintyre farmers. All were anxious to be able to support their families through the working of their own land in Upper Canada. Neil and I emigrated with children from my first marriage as well as from our own, his third. My son William Blue bought this property, Lot 9, F. Concession 1, where we are standing today. He took over a public house that a man named George Page had opened there. William placed his brother Angus Blue as the proprietor and Angus continued in this role for almost 20 years. 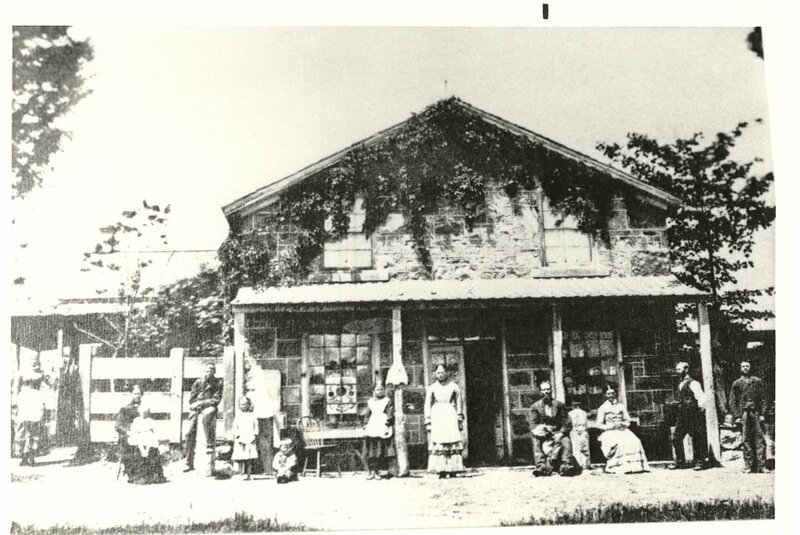 The lot changed hands several times between 1850 and 1864 when it was purchased by Donald Ferguson who had a fieldstone building erected to house the Killean Store and P.O., with living quarters in the rear. This was all after my time as I died in 1845, when this lot was still owned by my son. Any information after 1845 is on the word of the many researchers in the Puslinch Historical Society! The Blue tavern had stood W of Ferguson’s store, where the tennis court is on Betty Ferguson’s property today. Betty noted in her Families of West Puslinch that Angus Ferguson was quoted in an interview by the Puslinch Pioneer saying, that because of the comings and goings at the hotel there were some "indiscriminate burials of persons on the West side of the Thomson line" often of persons unknown. John Thomson settled Lot 10, F. 1, and it was the Thomsons and Fergusons who donated the land for this cemetery. The first two burials were of two sons of the Thomsons. After William sold Lot 9, F 1 in 1850, a daughter, Catherine, was born to his brother Angus Blue - former hotel keeper - and his wife Mary Whyte in Toronto in 1853. Catherine married Charles Patton, a 32-year-old Puslinch farmer in 1875. He was the son of James Patton and his wife Margaret Blue from Kintyre. The third son from my first marriage, Donald Blue, was living with his brother William on the 1861 Puslinch census, but by the 1871 census Donald was living in the Town of Guelph and his occupation was listed as ‘gardener’. William and Donald remained bachelors and when William died intestate, on 30 April 1870, Donald fought successfully in the courts for the family to be the beneficiary of his estate. Their brother Angus Jr. moved to Lot 16, Concession 2 after William’s death. At the 1832 land sale in York, my husband Neil purchased Lot 15, F. & R. Concession 1, and the farm west of us for our eldest son Matthew. Neil and I donated land on the corner of Lot 15 for the log West Puslinch Presbyterian Church in 1840. Lumber for the church was processed in a saw-pit on our farm, where it was cut by a whip saw which was run by two men. A log was rolled over the saw-pit, and one man stood down in the pit with the other on the ground above to operate the long whip saw. There was both an East Puslinch and West Puslinch congregation, ministered to by Rev. William Meldrum from 1840 to 1850. Fourteen years later the log west church was replaced by a frame church on Lot 26 at Crieff in 1854, once that community grew in size. A third building, built of yellow brick in 1882, was designated Knox Presbyterian Church, Crieff on Lot 26. Our son Matthew McPhatter married Jean "Jane" Ramsay, daughter of Archibald Ramsay and Christina McLean and pioneered Lot 14, F. Concession 1. He was one of the first trustees of the Killean school section. They moved to Beverly Township later in life and celebrated their 50th wedding anniversary at their farm there - not a common occurrence in pioneer days. Their daughter Grace, our granddaughter, married Richard Paddock (son of Thomas and Sarah) and farmed Rear Lot 15, Concession 1 which we had pioneered. Matthew’s obituary states the he was a "brainy, brawny, majestic old highlander." Finally, our son James McPhatter married Margaret Blue and farmed Lot 18, F. 1, connecting the two families by marriage. Before closing, I must tell you more about my second husband Neil McPhatter’s family. While Neil was the first in his family to come to Puslinch, two brothers and their father also followed. Neil was called "Neil McPhatter, the Elder" locally to differentiate him from his son Neil, from his marriage to Ann Milloy in Kintyre. There were five children from his marriage to Ann. She died in Scotland, as did his second wife Flora but they were childless. Neil’s youngest son, Hector, died on our voyage over at just 7 years of age. Neil had a little more education than most pioneers, and was a leader in the new community forming on Concession One. An old newspaper clipping tells us that he had taken the responsibility of the purchase of land in Puslinch for the group of settlers, evidently acting on their behalf in the transactions. Neil Jr., farmed Lot 17, Front of the Gore, Puslinch. He was a local blacksmith, working with his uncle Malcolm McPhatter, his father’s brother. Archibald, Flora and Charles McPhatter completed my husband Neil’s first family. My brother-in-law Malcolm was the first blacksmith in the Killean area and came to Lot 19, F. Concession 1 in 1832. He was born in Scotland in 1805 and was one of Neil’s two brothers to also settle in Puslinch. He set up shop at the side of the road and used dried hemlock bark in his forge instead of coal in those early days. Neil and my son James McPhatter, Malcolm’s nephew on lot 18, would steal into his shop on a Sunday and raise a racket by hammering on the anvil and making other loud noises, making it sound as though Neil was working on the Sabbath - much to the embarrassment and annoyance of his upright uncle. My father-in-law Archibald McPhatter followed his sons to Canada and lived with Malcolm but died just a few years after his arrival in Puslinch. Malcolm’s wife was Barbara Patton, and they had 10 children. She died in 1857 when the youngest, Donald, was only 4 years old. Malcolm remarried and moved to Grey County in 1865. In the next generation of McPhatters our grandson Matthew, son of Matthew and Jane, was born here at Killean in 1857. He had the foresight to gather the reminiscences of the old timers about their pioneering experiences in 1897 before the last of them passed on. Your Society printed them as "The McPhatter Letters" in 1991 - one of the first major acquisitions for the archives. He was a salesman, served in World War 1 as a Captain, went to Australia, and was a lifelong bachelor. He died in 1936. Neil himself was an upright, staunchly devout Christian. By the time I died, he was 63 years old and his large family about grown, but two years later he married again. His fourth wife, Mary Reid, was an extremely devout woman, according to historical records. She was a woman who lived to do good works, and she had an exceeding reverence and respect for the local minister, Reverend Meldrum. Neil outlived her too. He died in 1867 at the age of 85 and is buried here in Killean as were both Mary and I but, unfortunately, our stones have not survived. As you look around today, you can see the gravestones of so many of our family. In fact, there are 12 McPhatters on the Killean cemetery list. All had worked the land in this school section for their own benefit and not that of a landlord!" Research by Betty Andersen (McPhatters) and Lynn Crow (Blues), P.H.S.